This post is sponsored by VARIDESK. Find more on our sponsored post policy here. You know how we’re always talking about how the only changes that actually matter are big ones, and that you should always take giant leaps toward your goals and never work up to them little by little? Oh, right. We don’t say that. EVER. Small steps and daily choices make a big difference to your overall health. And our lives are full of opportunities to add new, healthy habits! You can opt to walk the dog after dinner rather than settling in for a few hours of TV, you can take the stairs instead of the elevator, you can bring your good-for-you lunch to work instead of going in on a pizza with your coworkers. And, while we’re talking about work … raise your hand if your booty is a liiiiittle too familiar with your office chair. We all know that sitting too much is no good for us, but did you know that spending just half your 8-hour workday standing up would burn an extra 130 calories a day, which equates to the calorie burn of running a 10k every week … or 11 marathons per year? And not only that, but that every two hours you sit has been shown to actually negate 20 minutes of your workout. Yikes, right? A few weeks ago, I told you how adding a VARIDESK standing desk solution to my office is a simple choice I’ve made to improve my health, and one of the best features of VARIDESK products is that they make it easy to go from sitting to standing and back again, as many times per day as you’d like. That’s super important, because you might think that standing all day is no big deal — after all, you’re killing it in the gym and can run 10 miles, so how hard can it be to stay on your feet? — but it’s actually a pretty major transition to make. So, to make it an effective — and long-term — change, you’ve gotta be smart in your approach. Here are the tips and tools I’ve used to successfully become someone who spends a good portion of the workday standing up. Tip 1. Set yourself up for success by making it easy to go from sitting to standing. Tip 2: Set goals — and timers to keep you on track. Y’all know how much I love a SMART goal, right? And that can totally apply here. Maybe you start out standing for 30 minutes, then sitting for an hour, and see how that feels. If you’re someone who can easily get lost in work for a couple of hours, set a reminder or alarm so that you get out of your seat regularly. Even if you find you can’t remain standing for as long as you’d initially planned, it’ll set the habit — and trust me, you’ll build up to standing for longer and longer periods of time. Pro tip: Using a mat (like VARIDESK’s anti-fatigue mats) to provide some cushion while you stand will be an enormous help. Tip 3: Stand — but don’t just stand there. Standing with zero other movement might burn more calories than sitting, but … we can do better. 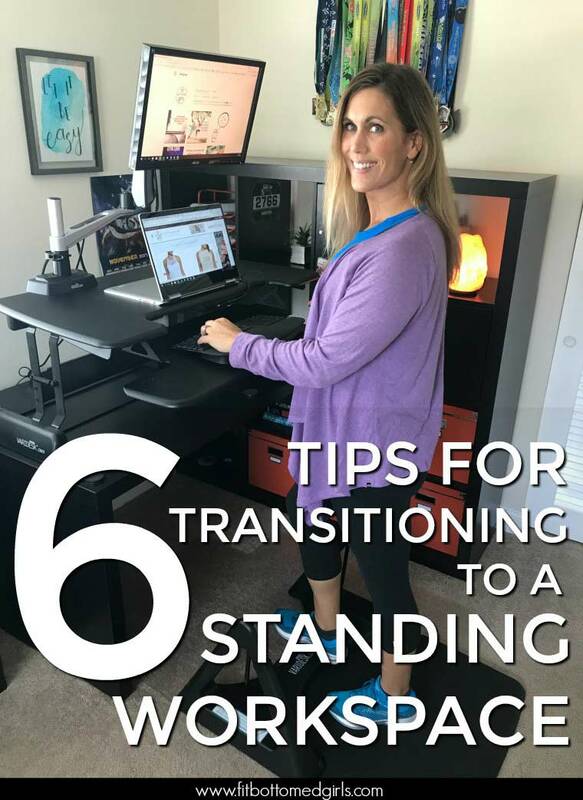 Providing your body with a bit of movement and some opportunities to engage a variety of muscles will allow you to get the most out of your standing workspace. You can do this by making a point to stand on one leg at a time, putting a foot on a small ball, or utilizing products made just for that purpose. I’ve been rocking (haha) the ACTIVEMAT ROCKER, and it’s not only fun, but has been a lifesaver on days when I had a tough leg workout in the morning. Turns out that keeping my muscles moving a bit allows them to stay loose — and that means way less soreness later that day or the next morning. Tip 4: Think beyond your legs. Tip 5: Make stretching and quick workouts accessible. I don’t have a ton of space in my office. It’s a shared space with my husband (who has a desk, some storage items, and a pinball machine in there), my two dogs (who obviously have to have a large bed in there), and my cat (who simply must have a kitty condo so she can look out the window). But even with the limited space, I’m able to carve out a little room for wellness. 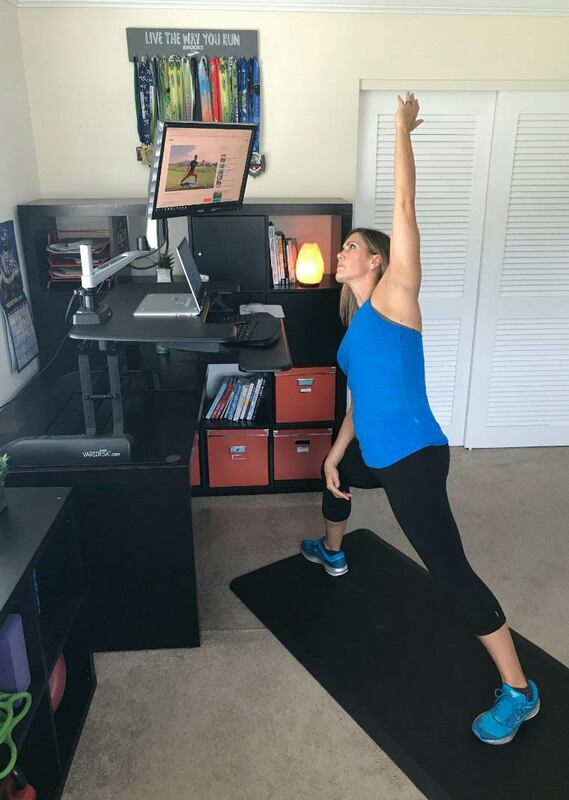 I store a resistance band, kettlebell, yoga blocks and a couple of weights in a small shelving unit, and when I want to take a break, I turn my monitor toward the middle of the room (which is easy with the aforementioned monitor arm!) and pull up a workout video (or one of these inspiring clips). Tip 6: Don’t stop when you sit. For starters, posture is always important, no matter what chair you have. We all find ourselves slouching on occasion, but next time you do, think about engaging your core, drawing your shoulders up and back, and sitting up straight and tall. If you want to take that a step further, take a look at what you’re sitting on. An active seating solution — like the VARIChair — encourages a dynamic range of movement and the engagement of your leg, back and core muscles whether you’re fully taking a load off or just leaning back a little.